This charming 3bdrm/2ba home is located on a spacious 1/4 acre lot just 2 miles from famous Camp Richardson beach and resort. Vacation Home Rental Permit #004875. Surrounded by miles of tree lined bike trails and hiking trails. 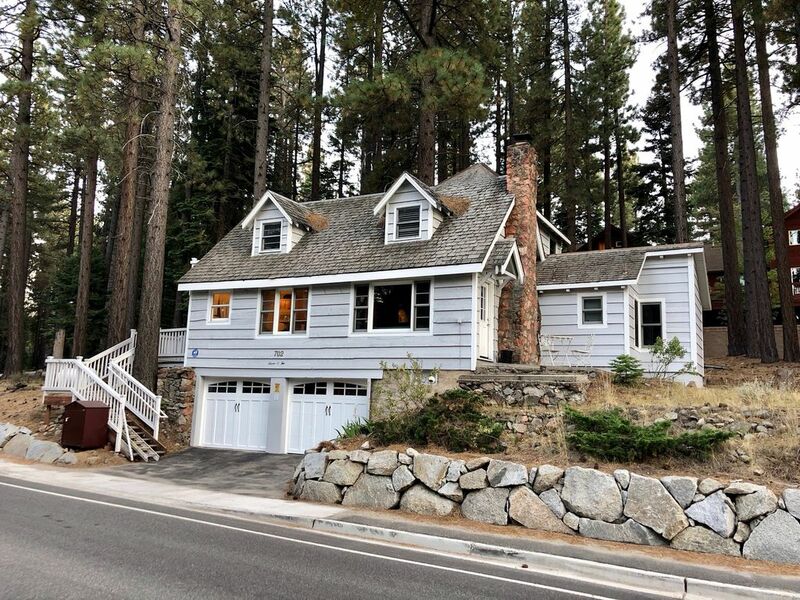 Short drive to Emerald Bay, Fallen Leaf Lake, Heavenly Ski Resort and casinos, Homewood Ski Resort and Sierra at Tahoe. Great restaurants less than 10 minute walk. It is located on a main road that is snow plowed regularly for easy access and short walk to convenient bus service. It has a 2 car garage w/remote control access on the right side and manual open on left. Right side fits up to 200" L X 78" wide SUV/car, left side is small-fits up to 164" L X 70" W small car. A small car can also fit in the driveway. For additional parking/larger vehicle, use public parking or many of my guests have parked at the restaurant across the street-(Must get Manager approval) New city ordinance does NOT allow street parking-large fine. Our vacation getaway was built in the 1950's and has been beautifully renovated with an updated warm, cozy feel. Each of the 3 bedrooms has a queen bed.There is an additional bonus room with a twin bed and a futon bed in the upstairs living room.The cottage has a wood-burning fireplace in the downstairs family room and a romantic electric fireplace in the upstairs sitting room. There is a flat-screen hdtv, dvd player and a large deck overlooking the backyard. Our children have enjoyed years of sledding in the backyard on the small hill. It features a separate dining room with double french doors opening to the back deck-perfect for family meals! We have tried our best to create an atmosphere that is relaxing and memorable. Tahoe offers so many options for fun activities! Fall is perfect for hiking,walking on the beach and enjoying the gorgeous lake and mountain views, golfing, horseback riding, etc. Winter and early spring is the perfect time for skiing, snowboarding, sledding, snow-ball fights, comfort food and fantastic restaurants. Summer is wonderful for picnics on the lake, hiking, biking, jet-skis, swimming, boating, and all seasons provide breathtaking views of the beautiful mountains and lake tahoe. This home provides a perfect space for two families to enjoy. Upstair has its own bedroom, sitting room and full bath. My husband and I met almost 30 years ago in a beautiful, red, 2 story cottage in South Lake Tahoe, very similar to our vacation home. I had flown to Tahoe to attend a friend's birthday and he was one of her roommates. We fell in love that weekend(I know, still hard for me to believe) and were married less than a year later. 14 years ago we were actively looking for a vacation home and I saw the listing for our vacation home. I called my husband and told him that it was so similar to the home in which we had met,and although at that time it needed a lot of work, we bought it and it became a labor of love. It has been the center of so many happy family memories. Our children are young adults now and our middle son married young and we have four beautiful grandchildren. They have helped us create another generation of wonderful family adventures. We hope to share our home and help other families create happy memories to last a lifetime. My husband and I fell in love almost 30 years ago when I was visiting Lake Tahoe...so Tahoe was a romantic choice for our vacation home. Our home is unique in the 1950's design and architecture. It is different than many of the cabins nearby with its cottage themed decor instead of all wood interior. Interior design is my passion and I am drawn to the eclectic warm and cozy feeling of cheerful colors that seems to take us back to a simple, family based lifestyle. For the knotty pine fan, we still have one room that holds true to that theme. Best of both worlds! Dining room w/double French Doors opening to deck. Several Disney DVDs, Action Movies, etc. Busy street, tight parking. Cozy and relaxing. I really enjoyed my stay at the house and noticed that something could use an update, there is only one television in the entire house so either its a good thing to bring the family together and watch the same thing or just have everyone bot watch anything. I was able to fit one car in the longer side of the garage but it was very tight and painstaking. What you don't know till yoy get there us that the location is on a somewhat busy street where the snow sweeping and four lane traffic is passing ever hour. There were bicycles but those were dusty and needs air as well as pad locks if you are to go to the store otherwise you'll be walking home. I feel that the backyard could be used for a better parking space. There was a propane grille out back but it was very so its a if you really wanted to use it kinda feel to it. Theres stairs everywhere so be careful if grandparents have that trouble knee and cant go up or down. House was great, location was great. Parking was only draw back if you have bigger vehicles. We had a suburban and a truck neither which would fit in garage but we made it work. If you have older people, there are many stairs!! We enjoyed our time here with all the accommodations that the house had. Very nice and cozy house. It's only 4 star because of the parking, otherwise it would have been 5 star. And, the parking was only a big deal because of the huge amount of snow when we happened to be staying there. Otherwise it would have been fine. The house was so cozy. The master was super romantic. Loved the ceilings and vintage details. Nice dining room. Responsive and helpful owner. Upstairs apartment was so charming. Great place and good location too. This property owner was more than helpful. This vacation rental was nice. Everything was clean and tidy. Had all the amenities what we need for a family gathering.